Although James Bond could never age or be younger and older until Daniel Craig took over but even the biggest hits age but they hopefully age with dignity and perform even better like good wine from the South of France – or wherever you order your wine from. 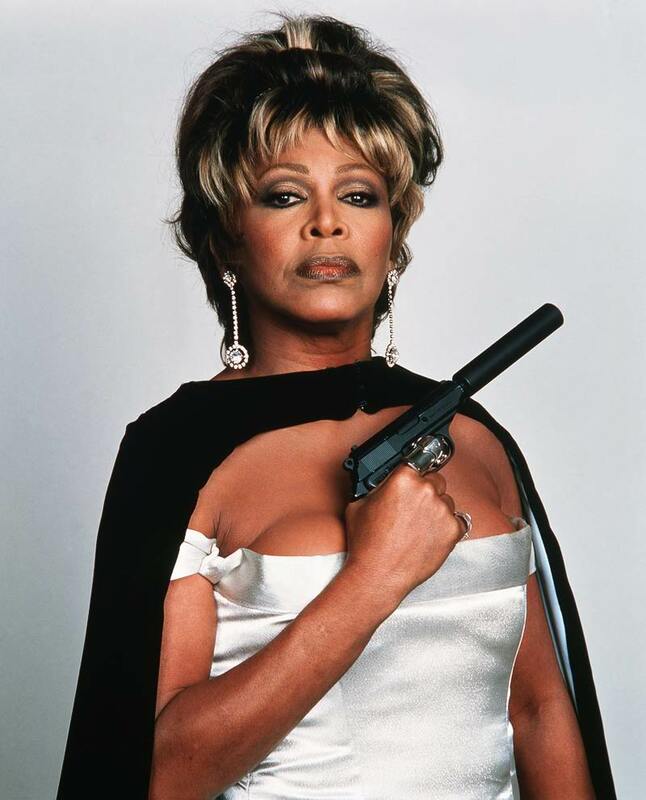 “GoldenEye”, the massive hit single for Tina Turner and the James Bond merchandise turns 20 in October 2015 and we can only compare it with the above-mentioned red wine. It aged with honor and dignity and can now be seen as one of the great James Bond songs and surely a signature hit for Tina Turner. GoldenEye can be seen as the secret lead single of the “Wildest Dreams” album which was released in 1996 and whose official lead single was “Whatever You Want”. It was featured in different versions on the European and US album editions – similar to the two different versions of “Whatever You Want”, and turned out to be the main visual concept of the 1996/97 Wildest Dreams Tour. The full background of the stage was used up by a large eye which was designed as a camera lens and which could be opened and closed and could also form a full circle in order to allow Tina to enter the stage through a circle of light onto a lift which then brought her down to the main stage. Quite a spectacular effect which proved to be a top combination with the song itself. Every GoldenEye release contained mixes which can be organized in two groups: group A consists of mixes which try and preserve the basic and typical sound of the song while group B aims for the clubs where – at least according to the remixers – only somewhat standardized beats plus Tina´s vocal track and some distorted „GoldenEye…GoldenEye…“ shouts were expected to gain some popularity. Well, to be honest, it couldn´t have been a signature hit if it wasn´t for the „parampampam – ba-daaa – parampambam“ opener and its use throughout the whole number. So, back then and still after all these years you are stronly advised to play one oft he group A versions and keep away from the Morales (sorry, my friend) mixes because they do not make much use of the core element of the song. Beethoven´s „GoldenEye #9“ mix could surely score but all the rest did not quite manage to score. Out of fairness, we have to mention that Shirley Bassey stills holds the record for singing not only two but even three Bond songs and that there is a good chance for her to remain in that position for the next 100 years. So – despite all the praise for Tina´s GoldenEye – competition is strong in the MI6 offices. And it is surely impossible to beat „Moonraker“, „Goldfinger“, and „Diamonds Are Forever“. Just in case you like jumping as Mr. Bond jumped: why not go to the Verzasca dam in 6596 Vogorno, Switzerland? First, you can enjoy coffee and cake with Tina at Lake Zurich and then move on to the Verzasca valley where they offer the original “GoldenEye Jump” or “007 Bond” – depending on what they hope to promote better. The only thing which is still in the making is the ultimate “Lose Your Wig Jump”. GoldenEye was the 17th movie of the installment and got an even bigger attention in 1995 because it was the first movie in a six years after a long law-suit, the first movie with Pierce Brosnan starring as 007, and finally also the first movie not to rely on story elements from Ian Fleming´s books. Whether the last „first“ is a good one is up to you to decide but three times a „first“ are better than only two. But for us Tina Turner fans all these „firsts“ cannot beat the feeling to sit in a movie theater, watch the opening sequence of a new James Bond movie and listen to Tina singing the title song. That feature alone was worth the ticket price, wouldn´t you agree? Please tell us about how the great music video was created and produced for what has to be one of Tina’s best songs as well as one of the best Bond theme songs.